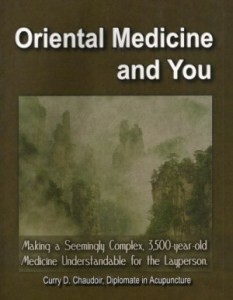 Did you know that acupuncture is at least two thousand years old? 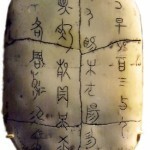 The earliest known writing about how acupuncture works was found on a tortoise shell dating back to 1500 BC. How acupuncture works has been debated for years, and there are many theories. Here is our interpretation of acupuncture and how it applies to modern medicine. Energy – Vital substance produced by the organs flowing on pathways to every cell in the body. Energy moves the blood. Blood – Fluid circulated by the organs and energy through the vascular system, carrying oxygen and nutrients to every cell in the body. Blood nourishes the energy. Organ – Part of the body adapted for specific functions that govern health, including the production of blood and energy. Acupuncture – a medical practice originating in ancient China, now widely practiced in the West, involving the use of hair-thin needles that are inserted into very specific points that improve organ system and circulatory system function, thus treating a wide variety of illnesses and health conditions. Chinese Herbal Medicine – Method of composing herbal formulas taken internally in the treatment of health problems. Oriental Medicine – Term used to denote a complete medical system in use for over 23 centuries that includes seven major branches of healing. Oriental Medicine recognizes 12 organs; the lungs, large intestine, stomach, spleen, gall bladder, liver, heart, small intestine, urinary bladder, kidney, pericardium, and the overall digestive tract. They produce blood and energy, which are the building blocks of proper body function. Blood flows in the blood vessels throughout the body. Energy flows on specific pathways throughout the body. Physical, chemical, or emotional stress can reduce organ function or slow blood and energy circulation. The function of your body is affected by stress. In some cases, extreme health problems have been observed, but it is more often not noticed at all. If the condition is allowed to go untreated, the body will attempt to support the affected area, but as the problem increases, the area starts to degenerate. The longer the condition is allowed to go untreated, the less chance there is for recovery. What began as a minor problem or discomfort may lead to irreversible damage. The purpose of Acupuncture and Chinese Herbal Medicine is to return flow of energy and blood back to normal and to reinstate optimal organ function. This will, in turn, encourage function to be restored to the affected area, and the body will begin to health itself. If detected early, organ malfunction and blood and/or energy stagnation may respond well to Oriental Medicine with an excellent chance for a complete and painless recovery. Historically, Acupuncture and Oriental Medicine recognize a subtle energy system by which Qi (pronounced “chee”) is circulated through the body. This transportation system is referred to as the channels or meridians. To better visualize the concept of Qi, and the meridians, think of the meridians as a river-bed, over which water flows and irrigates the land; feeding, nourishing and sustaining the substance through which it flows. (In Western medicine, the concept would be likened to the blood flowing through the circulatory system.) If a dam were placed at any point along the river, the nourishing effect that the water had on the whole river would stop at the point the dam was placed. The same is true in relation to Qi and the meridians. When the qi becomes blocked, the rest of the body that was being nourished by the continuous flow, now suffers. Illness and disease can result if the flow is not restored. Acupuncture is one tool used to restore the flow of Qi, by inserting needles into the acupuncture points (located on the meridians). These insertions are said to clear any residing blockages, or dams, thus freeing the river to better feed the body in its entirety. Acupuncturists can use as many as nine types of Acupuncture needles, though only six are commonly used today. These needles vary in length, width of shaft, and shape of head. 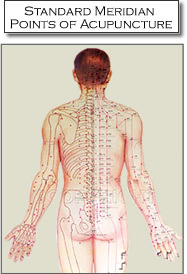 There are a few different precise methods by which Acupuncturists insert needles. Points can be needled anywhere in the range of 15 degrees to 90 degrees relative to the skin surface, depending on the treatment called for. In most cases, a sensation, felt by the patient, is desired. This sensation, which is not pain, is called deqi (pronounced dah-chee). Some acupuncture techniques require manipulation of the needles immediately following insertion: Raising and Thrusting, Twirling or Rotation, Combination of Raising/Thrusting and Rotation, Plucking, Scraping (vibrations sent through the needle), and Trembling (another vibration technique). Once again, techniques are carefully chosen based on the ailment. In our clinic, we practice a gentle Japanese style of acupuncture. Because of this, we rarely have to manipulate the needles once inserted. Japanese style treatments are gentle and relaxing, yet more effective at treating a wide range of ailments. 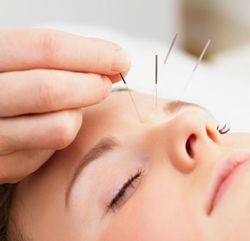 There are many health conditions that can be treated successfully by Acupuncture. The most common ailments are: back and neck pain, joint and muscle pain, arthritic conditions, headaches of all kinds (including migraine), allergies and sinuses, hormonal imbalance (PMS, menopause, infertility), and digestive distress (IBS, colitis, etc.). However, because acupuncture is a functional medicine, it can treat a wide variety of different conditions. 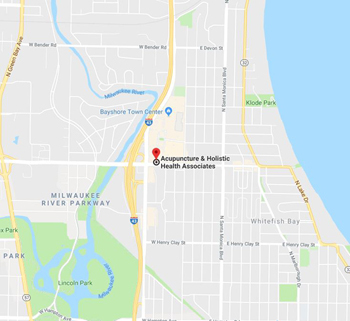 For more about conditions we treat, click here.